The Victoria and Albert museum in London was not of particular interest when I read the description. It sounded like lots of blingin’ artifacts without the context to make them interesting. But the Natural History Museum looked like a Easter weekend riot might break out at any time, and we still had a couple of hours to kill before meeting up with other Catalhoyukians for a reunion, so the V&A it was. We wandered through the Middle East exhibit without much enthusiasm, then headed up to the 6th floor ceramics hall. (Which was pretty nice, and had a big exhibit on how ceramics have been decorated and constructed throughout time.) On our way up we passed by the architecture room and I saw the beauty above–a 12′ x 8′ isometric drawing of St. Paul’s cathedral. 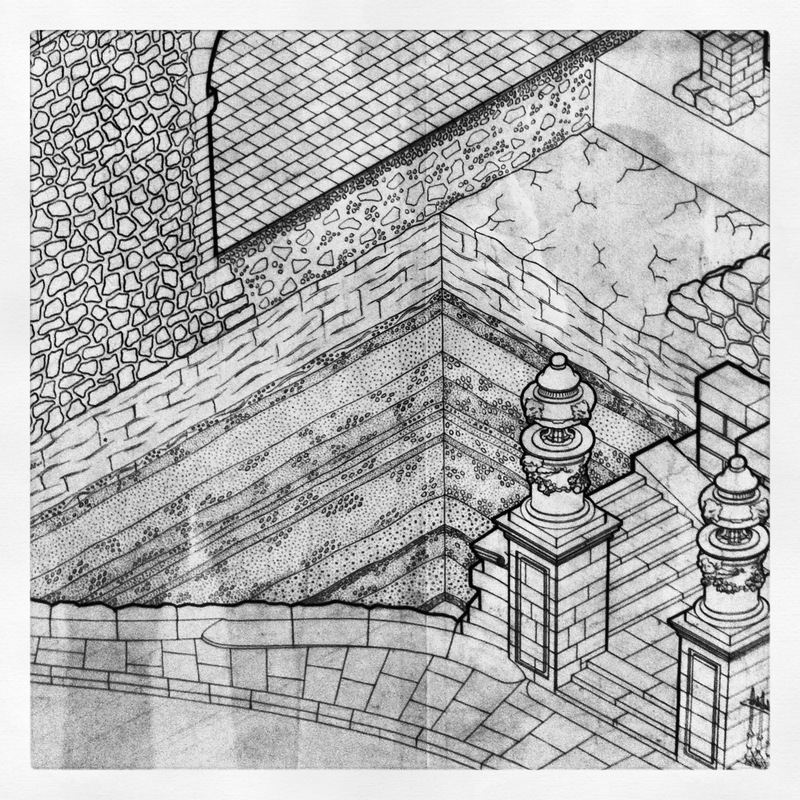 An isometric drawing (technically an isometric projection) is a way to show three-dimensional objects in two dimensions. If you’ve ever drawn a cube, you’ve done an isometric drawing. They’re useful for architects who want to depict building interiors and exteriors together and for archaeologists who want to show stratigraphic relationships between building components. 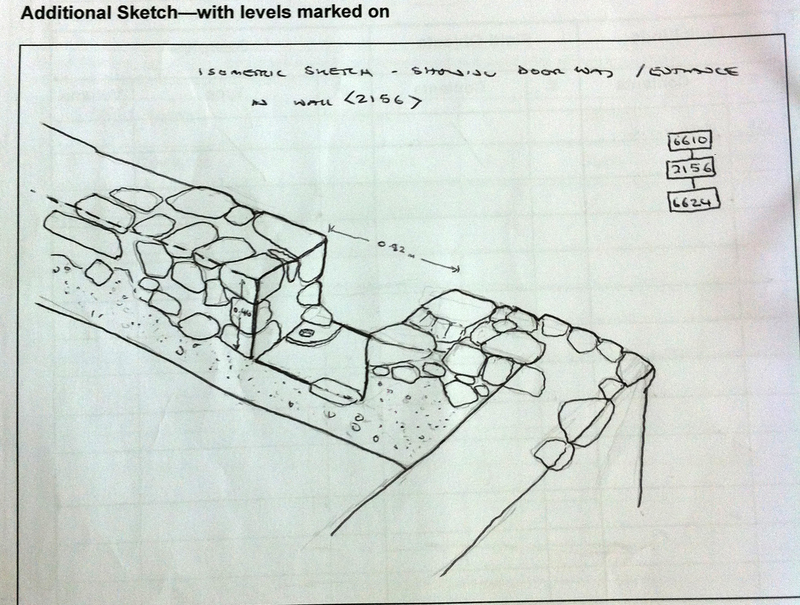 Archaeological isometric drawings can be either measured to scale or sketched with measurements added to the drawing. I learned how to sketch isometric drawings of archaeology from my dear friend Michael House, one of the most gifted archaeologists I’ve ever had the pleasure of working with. This is one of his sketches that I happened to see on his desk and took a quick snapshot. In it you can see the relationship of a threshold to the surrounding wall and to the internal render on the wall. As you can see, the sketch is just that–it is a quick representation of the relationships of the various elements of the archaeology to each other. The walls are not truly as square as the drawing would imply, and the roughness of the stones is captured by their irregularity in the drawing, but are not drawn to show texture. 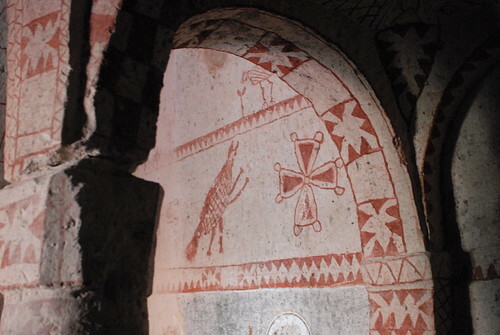 Isometric drawings are becoming rare in archaeology. It is much easier to reconstruct a building using a program like Sketchup, then manipulate the perspective to show the various elements of the building. Though isometric drawings are a well-honed skill for archaeological illustrators, I don’t know many archaeologists who sketch isometric drawings in the field, and I’m afraid it is becoming a lost art. When I leaned in to look at the drawing of St. Paul’s, I could see all the traces of pencil left after the drawing was inked. You can also see a couple of mistakes, such as in the column on the left. But I was happiest to see the depiction of the stratigraphy beneath St. Paul’s–just a little archaeology sneaking in with all the gorgeous architectural detail. 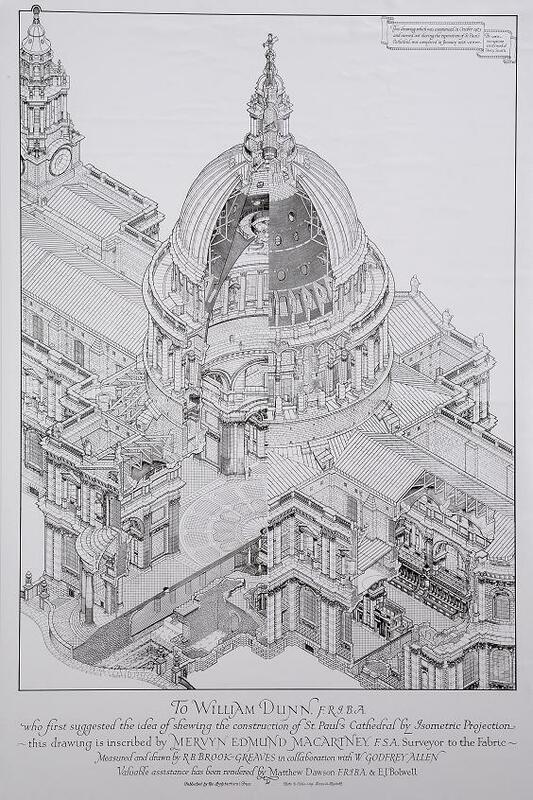 It is not likely to be correct, as the isometric drawing shows a fictitious section through the building, but it was nice to see that the architect was aware that there was history below even a building as ancient and as storied as St. Paul’s. For my very last (and, at this point, quite late!) paper of the semester, I am comparing the volcanic tuff architecture of Cappadocia and that of the Southwestern US–Pajarito Plateau, to be exact. I’m particularly interested in cavate architecture–where the tuff is actually carved into for more than a back wall/support structure as you see in many of the cliff dwellings in the Southwest. It’s not a perfect fit, but it’s interesting comparing how people used the soft, sculptable rock in two different regions of the world. The reading is actually a little sparse–there isn’t a lot in the way of useful literature about Cappadocia written in English and not a lot of archaeology has been done in the region, besides Asikli Höyük, another Neolithic tell site that some of the Catal folks work at. The Southwest, on the other hand, has an immense amount of archaeological work published, except for most of it is about pottery–not very many architectural analyses that specifically look at tuff. 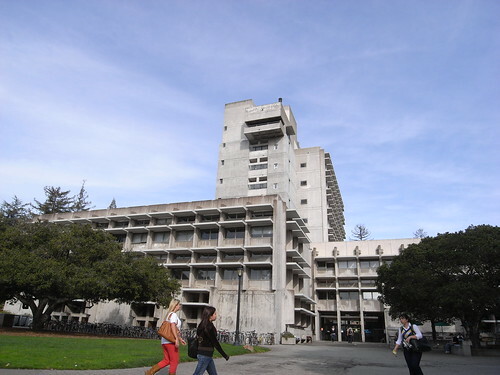 And the books that may be relevant are all stored in the Bancroft library, which is hands-down the worst library I have ever been to. It’s an archive, so they’re doing their damndest to keep YOUR grubby hands off THEIR precious material. But archiving books from 2005 that I could buy for $25 from Amazon and then throwing a big fit when I try to get them to fetch it from the big storage house in the sky, the NRLF? Not altogether a wonderful fit for a researcher. Just a quick reminder that I’ll be around on Second Life for most of today (especially after 12) at Okapi Island (125, 93, 47) for Remixing Catalhoyuk Day. We’re getting some neat coverage; a writer for Archaeology magazine was out a couple of days ago, and I talked to the editor of the Second Life architecture blog today for a bit. My name is “Clementine Glass” on there, for what it’s worth.